I'd take that bet...I'd place odds that an enraged Ovi would cause some serious carnage. Ovi vs Malkin would be an interesting fight. Then again, it's Malkin...so he probably just literally stabs Ovi in the back with a literal katana. Where'd he get the katana? I dunno, it's Malkin, I just assume he has a katana on hand at all times. 3-0 Canes, shots are 34-10 for the Canes? WTF? The Caps had no shots on that PP? Why so glum, chums? Rod the Bod must've given one hell of a pregame speech. Holy s***, the Caps look drained. Canes just playing with the puck in their zone. I'm guessing without Holtby this would be worse. And would ya look at that..Hamilton!! 4-0!!! Give him a mustache and he's basically Quenneville. He took his shirt off and showed why he's the ultimate butterface? Another Canes PP? Caps be mad. That nose has seen some s***. Very true. They look very un-Caps like right now. Losing 5-0, 44-12 shot count for Carolina, lost track of the Caps penalties. They look tired and frustrated. Mrazek preserving his shutout. Big saves. I just saw the Ovi beatdown of Svetch. That was brutal, knocked him out. Wonder if Svetch will be OK for Game 4? Damnnn. Not very often you see guys get slept like that. Hope he's ok. 19 year old rookies have no business going at it with Ovi. The great8 shouldnt be beatin on rookies, but its the playoffs n hes losing... all bets are kinda off. Young Svech will think twice next time. I believe Ovi said if he didnt make it in hockey his other option was likely being an enforcer in the Moscow mob. 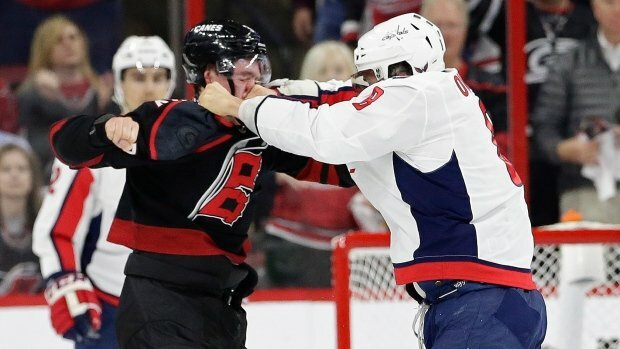 Ovi is skilled enough to not have to fight, but he could prolly make it as an enforcer in this league if he wanted to. Dudes a beast. He knows 1st hand what Ovi's knuckle sandwich tastes like. Agreed. But you don't want a 50+ goal scorer taking 5 min fighting majors all the time. Wilson usually handles that s***. Ovi is what Todd Bertuzzi was for a few years, before he became a big softie. Yeah, Todd didn't hit 50 points until about 5 seasons into his career. 62 points in his first two seasons in NYI. 140 games. Tyler already has 71 points in 128 games. He will only get better. Todd had more than double the amount of PIMs in those first two seasons, but Tyler is a few inches shorter and around 50lbs less, he doesn't have the weight to throw around like his uncle did. Well, until Moore, then he was scared to hit people. Todd's best season was 97 points, also had 144 PIMs that season, highest season total. Beast mode. Yikes, I keep wishing Svech would've done something other than just square up and eat those punches. Can't just sit there and trade with a gorilla like Ovi.